I have known of Ten for many years now, but I have never found them interesting enough to bother checking them out. For some reason I really don’t know. I know about band leader / founder and singer Gary Hughes, that he’s the one writing songs for Magnum’s Bob Catley’s solo albums and I know that when Ten started out, Hughes recruited former Dare guitarist Vinny Burns. I always thought Catley’s solo albums were good enough, but they never hit me hard in the gut, the way great music should. So I never bothered with Ten at all. Why now, then? Well, in all honesty, I got a link for a review and even though I might not have time to review every album that comes my way, I will at least give them a listen to see if there’s any chance I might find it interesting enough to write about. Back in 1994, when grunge – and then a little later nu-metal – ruled the charts, Gary Hughes took the bull by its horns and formed – an AOR band! This might not have been the most brilliant idea , looking at it from a financial point of view. But If you have a calling, there’s not much to do but to follow that, I guess. And I really adore and respect people who follow their vision, not giving a flying f**k about what’s hip or not. All glory to Gary Hughes for doing that. Ten released their debut album X in 1996 and since then they have released 11 more studio albums including this one and also one live album. Impressing! The only member left since the band started out, though, is Gary who has been the captain of the ship since day one and the guy who has kept the boat afloat. There has been up and downs every now and then throughout Ten’s career and there has been a few years when the band did release albums, although those have passed me by completely. But last year they released Albion, an album that got some rave reviews and all of a sudden, Hughes and his partners in crime got some attention again and the band was on the map once more. I haven’t heard the record myself, in fact this album is my first real acquaintance with the band, so I was curious of how I would react to their music and sound. Now, Ten is an AOR-band that rides on the border to melodic rock and this is music I normally like, so it’s actually a bit weird that I haven’t listened to them before. 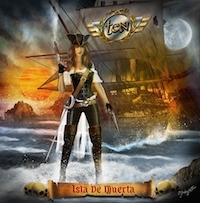 On Isla De Muertes, Ten gets into a pirate mood and for anyone who’s into that stuff and don’t wanna listen to mediocre power metal such as Running Wild, maybe this album will do. I kinda like like pirates, but then again, I don’t really care about them enough to buy an album because of them so I’ll put the theme aside and just concentrate on the music alone. First song “Buccaneers” is an instrumental that goes right into “Dead Men Tell No Tales” and its hooks instantly gets to me. A good song with a somewhat Celtic feel and the arrangements makes me think of movies such as “Pirates Of The Caribbean” – I really dug those movies. First single “Tell Me What To Do” comes along and it is a much more AOR-ish song than the opener, that was more melodic hard rock. It’s very catchy and I’m not surprised they chose this song as the first single. It also holds some very good guitar work. “Acquiesce” should be the next single. The melody is fantastic and the whole thing is just so damn catchy. “This Love” is the album’s first ballad and it is a real killer. It goes into power ballad territory, but it doesn’t sound like the old, used power ballad-stuff we’re used to, it has its own arrangements and therefore stands out – good job! They come into heavy metal territory with “The Dragon And St George” – heavy metal with an AOR production and arrangement – and that works really well. “Intensity” is just awesome, with a chorus from Hell, catchy as can be, this tune must be a single. It has all the potential in the world to become a hit. The instrumental “Karnak” goes right into “The Valley Of The Kings”, a progressive AOR tune that has a lot in common with the kind of pop metal that Nightwish has been playing on their last three records on some songs – good song, indeed. The progressive side of their music continues with “Revolution”, but the whole sound of it is very AOR, so it’s not exactly Dream Theater music we’re getting. “Angel Of Darkness” is heavy AOR and the song goes in a more in-your-face kind of hard rock which breaks the mold a bit. If we don’t count the European bonus track (we’ll get to that one soon), “The Last Pretender” is the song that closes the album. It’s a melodic rock song, very Bon Jovi-like, a bit mainstream, but the chorus is really good. The European bonus track I talked about earlier is called “We Can Be As One”, a power ballad that sounds more 80’s than power ballads ever did in the 80’s. It’s not bad, but it is too cheesy for comfort. This time I get the whole bonus track thing. Song wise, this is a really good album and I’m thinking that maybe I have missed out on something here. But on the downside, the production leaves a whole lot to be desired. It’s bland, stuffy sounding and it lacks power, bite, attack, punch and aggression – elements I really want in an AOR production and frankly, it takes away one point in the final rating. Also, the drums sound programmed which is another thing I have a problem with – a crying shame as the songs here are all really good and the musicians very good. And not to be an a-hole, but the weakest link here is actually Hughes himself. I won’t say that he is a bad singer – no Ron Keel/Mike Tramp/Phil Lewis/Vince Neil alert here – but his range is quite limited and I feel that the songs could probably have benefitted from a stronger voice – AOR usually do need great vocalists. But don’t get me wrong, Hughes’ voice works alright and it’s really not that big a deal. AOR fans will find a lot of goodies on this record and as for me, it makes me want to check out Ten’s earlier stuff. I might just get on to it when this review is written.